Some left-leaning folks have called for a boycott of Indiana to pressure the state into overturning this law. Shakesville has an amazing rundown on why this is not really helpful or cool, along with some suggestions on other ways to be supportive of queer Hoosiers. Below are some things we are planning to do. We’re planning to let businesses in Indiana know a carload of queers would like to throw money at them on each tubing trip. If you’re in a place where it’s safe for you to do this face-to-face, this is a good way to go. You’re putting a human face on discrimination and forcing a direct, in-person “no” from small business owners and employees who would probably very much like your business. If you’re not gay, not out, or worried about a direct confrontation, you can also call ahead and ask a business if they discriminate without directly revealing why you ask. It’s easier for the business owner to view a phone call as something abstract, but you can still force the conversation and let them know this issue matters to you and isn’t going away. It may seem obvious, but one of the easiest ways to change people’s minds about a group is to let them meet members of the group and challenge the negative stereotypes they have. If you’re calling for a boycott of Indiana or calling for all LGBTQ people to vacate the state, you’re making it easier for the people you disagree with to demonize you and your views and never encounter a challenge to their beliefs. While we firmly believe that telling all progressives to give up on red states isn’t an answer, we want to acknowledge that self-care can necessitate minimizing your identity or leaving a place. I’m writing this from Chicago and not my hometown in North Dakota, so I totally get needing to be in a place with people like you. We won’t ask anyone to risk their health or safety to try to change minds, but interaction is key to understanding and empathy and we hope that as many people as possible can support this goal. 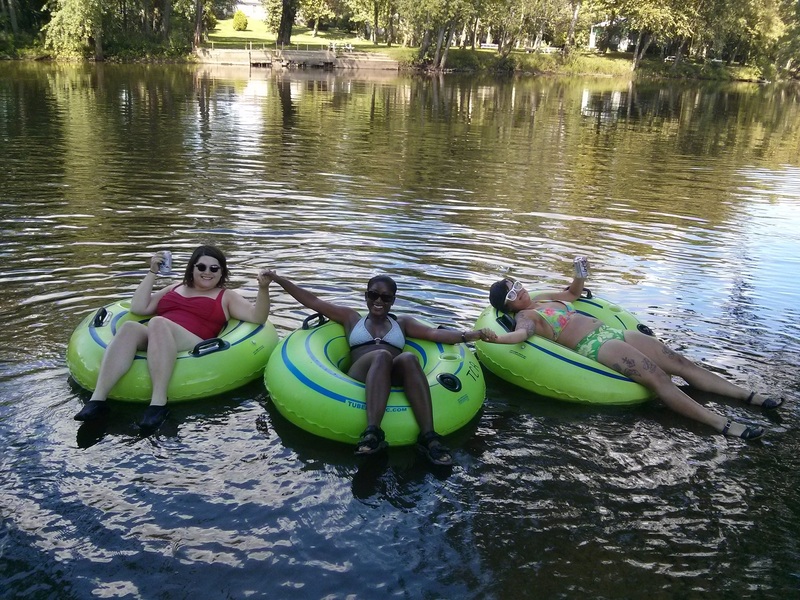 If you’re not going tubing in Indiana every week this summer, you can still give the people of the state your love. Indy Feminists have compiled a list of organizations doing advocacy and service for queer Hoosiers. A friend from Indiana pointed me to another group she’s worked with: NE Indiana LGBTQ Coalition. If you have a few dollars, send them toward one of these groups. Let’s acknowledge the people who are working hard to make their state a better place to live. Sadly, this bill isn’t the only equality issue impacting people in Indiana right now. Hoosiers are also dealing with pressing issues of healthcare access and reproductive freedom (a rural HIV outbreak as a result of shuttered Planned Parenthood clinics, a woman sentenced to prison for a miscarriage) so anyone providing services to marginalized people could really use your support right now. This is also a good reminder that “just move” isn’t the most practical advice when you have regressive policies steamrolling over the rights of increasingly large swaths of the state’s population. Many people can’t move even if they’d like to and they need resources in their communities. Want to fight back against the tired idea that everything not on a coast is a hopeless cesspool of reactionary politics? Help raise the profile of people who live in flyover country who are doing cool stuff. Just like most places with a few million people, Indiana has some rad queer musicians. Take the money you’re saving on homophobic pizza and drop it on a record from one of these bands. Closet Burner is a queercore band from Bloomington. Their bandcamp is sold out of their LP on pink vinyl, but you can still listen to their tunes and buy a digital copy of their album. They’ve played Chicago before and will almost certainly do so again, so keep these folks on your radar. High Dive is a queer-positive pop punk band also from Bloomington. I’ve got a huge soft spot in my heart for pop punk and sad punk and I’m kind of in love with these guys now. You can grab a digital copy of their 2014 EP on Bandcamp or import the vinyl from Yo-Yo Records in Germany (so fancy!). And just to show queer folks in Indiana were making punk rock before I even knew what punk was, here are The Sissies (1998-2002), a queer punk band from Bloomington so legit they have a Wikipedia page. We want to hear more good music from Indiana, especially from the queer community. If you know a band we should include in this list, please let us know!